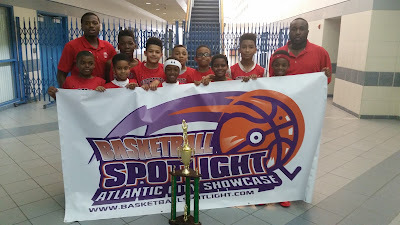 BASKETBALL SPOTLIGHT NEWS: Basketball Spotlight Atlantic City Showcase 4th Grade Championship Recap: Expressions Elite Wins Thriller! Basketball Spotlight Atlantic City Showcase 4th Grade Championship Recap: Expressions Elite Wins Thriller! In one of the best games over the weekend Expressions Elite defeated the Gauchos 36-35 to win the Basketball Spotlight Atlantic City Showcase 4th Grade Championship. This thriller came down to the last shot as the rock rimmed out for the Gauchos. Congrats to both teams for making the finals and treating us to a dandy. We look forward to seeing both of them at the Memorial Day Classic.